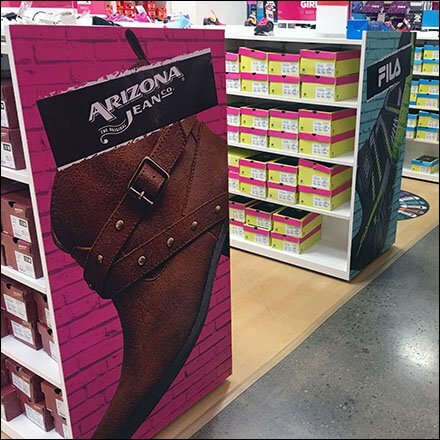 Famous brands participate in Endcap Billboarding In The Shoe Department to both identify, and inspire sales interest. A shoe is a shoe is a shoe. But Nike vs Converse vs Fila vs Arizona Jeans as an interloper creates more interest. The Billboarding invites passersby to see what is stylish this seasons by the biggest brands. A great use of flat Endcap space as visual promotion, though the aisle was too tight and distance viewing to limited to have more than short-range impact. Still a smart sign promotion, with a bit of Category Definition built in, albeit brand diversified. Note that while Endcap Billboarding In The Shoe Department illustrations vary, brand logo placement is consistent, Endcap to Endcap.